For many of the artists on display in the Great Neck Plaza courtroom at 2 Gussack Plaza, it was a showcase of passion, patience and perseverance. Steppingstone Park by Ann Seki. 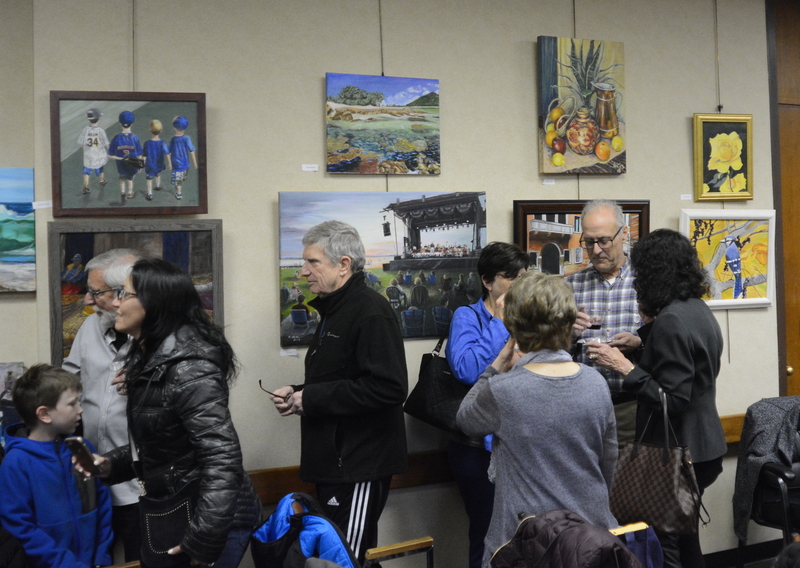 The courtroom, encased in paintings from Great Neck Public Schools Community Education students taught by Mina Rabbani, was abuzz with conversation during a reception early Wednesday evening, where artists, along with family and friends, explored a wide range of works. 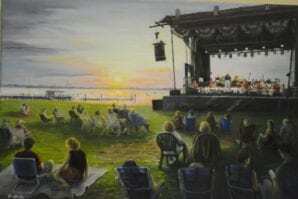 Among the roughly 40 paintings on display were landscapes, including one of Steppingstone Park in Kings Point, colorful portraits of people and animals, and an array of flowers. One of the artists was Barbara Silver, who said she began painting only three and a half years ago. She was always an athlete and “never knew” she had a talent for painting, Silver said, but after retiring wanted something to fill her time. 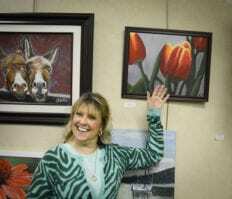 Nancy Kantaris, another artist on display, also began painting recently. After trying at a sip and paint night at the Muse Paintbar in Great Neck Plaza, she investigated art classes and discovered Rabbani’s courses, Kantaris said. Now her first ever color painting – that of warm looking tulips – from that class is on display. 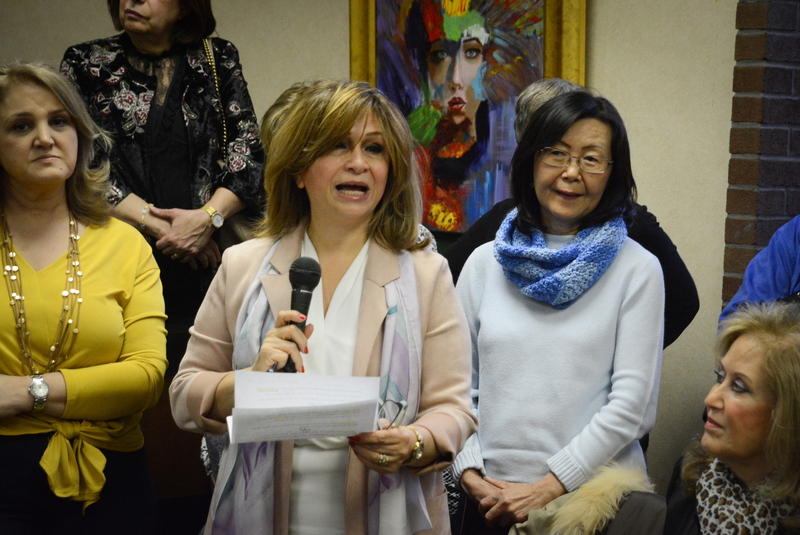 Mina Rabbani, a Roslyn resident, has spent more than 30 years teaching in the Great Neck schools, offering courses for beginners, intermediate painters and more advanced artists. Beginning students learn the fundamentals, like how to use color, form, shading, space, texture and composition to create successful pieces, while more advanced students begin to develop their own personal art styles. Rabbani said that with her classes, she aims to teach students “a little bit of everything” – still life, figures, portraits and landscapes. She also places an emphasis on their developing their own art style and self-expression. 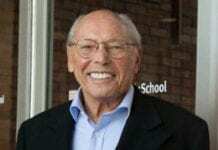 In the process, Rabbani said they all become a sort of family. Paula McNabb, who started painting exactly a year ago, said she always wanted to paint but never had time before. She said she was “very nervous” in the beginning, but found the class to be very supportive, instruction “very great,” and the class atmosphere positive. “I will keep going,” McNabb said when asked if she planned to continue. The exhibition will be on display until the end of March at Great Neck Plaza Village Hall from 9 a.m. to 4:45 p.m. Monday through Friday. For more information about Rabbani’s courses or to potentially register, call 516-441-4949.